NASA and NOAA satellites continue to provide data as Post-Tropical Cyclone Hermine continues to linger south of Long Island, New York. The winds from the storm continue to affect surf from the Mid-Atlantic to Cape Cod, Massachusetts. At 1:55 p.m. EDT (17:55 UTC) on Sept. 5, NASA-NOAA's Suomi NPP satellite passed over Hermine and the Visible Infrared Imaging Radiometer Suite (VIIRS) instrument aboard NASA-NOAA's Suomi NPP satellite captured a visible image of the storm lingering off the coast of New York and southern New England. The VIIRS image showed the bulk of clouds in the northwestern and northern quadrants where the strongest winds were located. An animation of satellite imagery showing the slow movement of Hermine over two days was created by the NASA/NOAA GOES Project at NASA's Goddard Space Flight Center in Greenbelt, Maryland. The animation of infrared and visible images from NOAA's GOES-East satellite shows very little movement from Sept. 4 through Sept. 6 at 10 a.m. EDT (1400 UTC). On Sept. 6 at 11 a.m. EDT NOAA's National Hurricane Center (NHC) said A Tropical Storm Warning is in effect for the coast of Long Island from Fire Island Inlet to Port Jefferson Harbor. The tropical storm warning has been discontinued for Block Island, Rhode Island; Martha's Vineyard and Nantucket, and the coast from New Haven, Connecticut to Sagamore Beach, Massachusetts. At 11 a.m. EDT (1500 UTC), the center of Post-Tropical Cyclone Hermine was located near 39.5 degrees north latitude and 71.9 degrees west longitude. 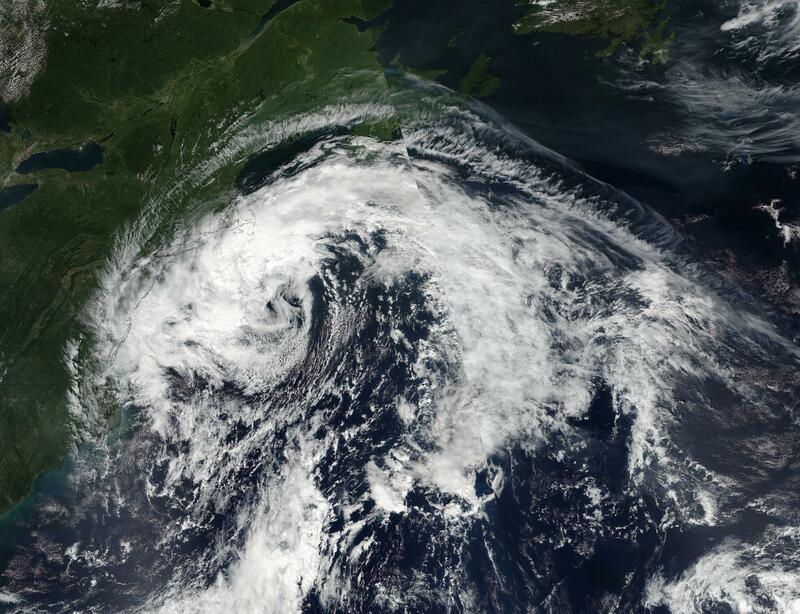 That puts the center of circulation just 110 miles (180 km) south of the eastern tip of Long Island, New York. The post-tropical cyclone is moving toward the west near 3 mph (6 kph). NHC said a slow and erratic motion is expected for the rest of today and tonight, followed by a slow motion toward the northeast on Wednesday, Sept. 7. Maximum sustained winds have decreased to near 60 mph (95 kph) with higher gusts. Additional gradual weakening is likely during the next couple of days, and Hermine may weaken below tropical storm force by Thursday. Tropical-storm-force winds extend outward up to 140 miles (220 km) from the center, so the extend well inland from coastal New York. NHC noted "Large waves generated by Hermine will continue to affect the U.S. East Coast from the Mid-Atlantic States through New England for another couple of days."